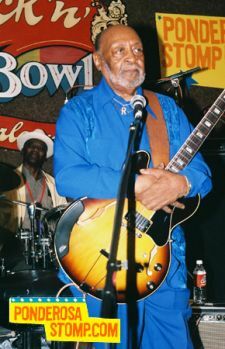 Robert Lockwood, Jr. – One of the last surviving roots bluesman of the twentieth century. Robert Lockwood Jr. was born March 27, 1915 in Turkey Scratch, Arkansas, a farming hamlet about 25 miles west of Helena. 1915 was remarkable because several other monumental blues artists were born within a 100-mile radius that year; notably Muddy Waters, Willie Dixon, Little Walter Jacobs, Memphis Slim, Johnny Shines, and Honeyboy Edwards. They would all meet up in the future. From the early 1980s to 1996, there were no domestic Lockwood releases. In 1998, I've Got to Find Myself a Woman was released by Verve, gaining a Grammy nomination. This was followed by Telarc's Delta Crossroads, also a Grammy contender in 2000. In 2001, What's the Score was re-issued on Lockwood Records which has the rights to his Japanese live recordings, previously only available on Peavine. They will be a future project. Not content to rest on his laurels, Lockwood is touring more than ever at age 86. Lockwood leads an eight-piece band every Wednesday at Fat Fish Blue in Cleveland, roams the world playing his jazz-tinted Delta Blues, and records once a year. Lockwood is in better mental and physical shape than many men years younger. His guitar playing is as crisp as ever. Like a fine French cognac, he is only getting better with age; no dust, rust or must here.